We are recognized Manufacturer, Exporter, Trader, and Importer of a wide range of Paper Snack Tray, Paper Snack Tray, Printed Garment Tags, etc. 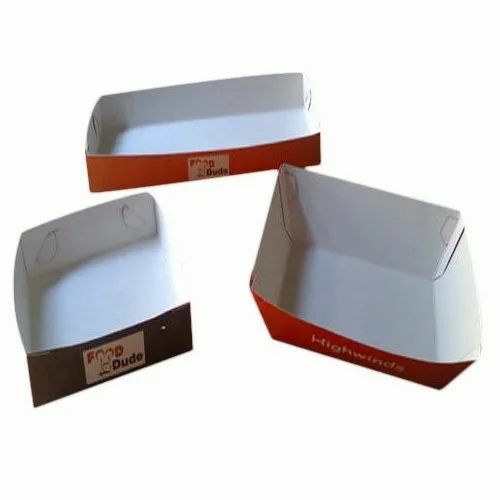 We are considered as one of the Manufacturer, Exporter, Trader, and Importer of an exclusive array Paper Snack Tray, Paper Snack Tray, Printed Garment Tags, Printed Stickers, Paper Bags, Food Pouches, Wrapping Paper, Snacks Boxes, Packaging Boxes, Printed Burger Boxes, Printed Tissue Papers, Butter Wrapping Paper, etc. All the products are made of superior quality paper and other raw materials which are further combined with beautiful prints and various colors. These products are offered in different sizes and types which completely meet the user's requirements. We also provide Printing Services to our clients.